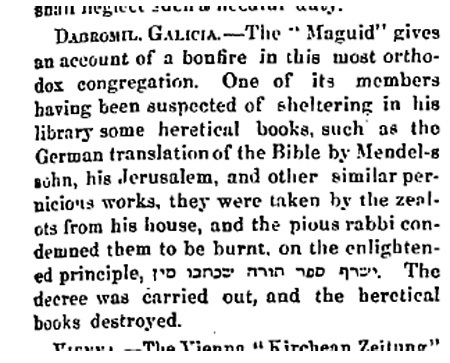 Here's an account of a book burning in Dobromil in the American Israelite (March 2, 1860), taken from Hamaggid (Jan. 5, 1860/10 Tevet 5620). Interestingly, one of the books that is mentioned in the original Hebrew, but not the English, which only mentions books by Mendelssohn, is Agadat Arba Kosot by R. Solomon Pappenheim (and this one too). The font looks like Divrei Kehilles (S. Geiger). Interesting that of all the book-burning images he could conjure, the one that came to mind was the "Arab Caliph of Alexandria."